Not only is the 2015 Kia Soul EV cool, quirky and fun to drive, but it is also a force to be reckoned with! The iconic exterior design and impressive interior features is only improved by an all-electric engine! Take the 2015 Kia Soul EV on a smooth, agile, and efficient drive around the city and watch as heads continuously turn to catch a glimpse of the all-new 2015 Kia Soul EV. Stop by Carriage Kia, located in Gainesville, GA, to learn more about the EV that is taking the world by storm! The 2015 Kia Soul EV is powered by an efficient permanent magnet AC synchronous 360V electric motor generating 109 horsepower and 81.4 lb-ft of torque. Due to the all-electric engine, the Kia Soul EV is one of the most efficient vehicles on the road! It can achieve an impressive 120 MPGe city and 92 MPGe highway*. The 2015 Kia Soul EV continues to do what Kia Soul’s have always done, attract attention from their fun exterior design. Now, this EV gets even better with features including: body-colored bumpers with contrasting color accents, body-color front grille charge port door, dual body-color heated power mirrors and LED turn signal indicators, projector beam headlights with auto light control, jewel-type LED positioning lights, LED rear combination lamps, solar control glass, heated rear glass with timer and wiper/washer, and alloy wheels. The 2015 Kia Soul EV continues to shock and impress! With the ability to drive for miles without having to stop in the 2015 Kia Soul EV, these interior features may give you reason to just keep on going! 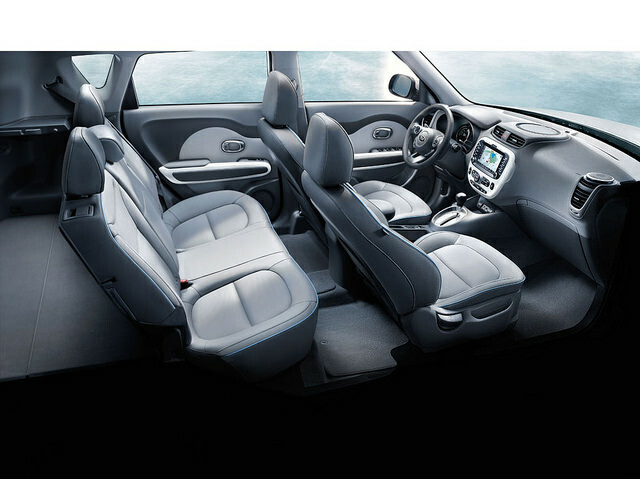 Some of the standard interior features include: AM/FM/CD/MP3/SiriusXM audio system with 6 speakers and dash-mounted tweeters, UVO eServices Infotainment System, rear camera display, Voice-Command Navigation with 8” display and HD radio, Bluetooth® wireless technology hands-free connectivity with steering-wheel-mounted controls, supervision meter cluster with 3.5” Organic Light Emitting Diode (OLED) color display, flex steer, Active Eco System, push-button start with start key and immobilizer, center console with armrest, luggage under floor tray, bio fabric seat trim, heated front seats, and a leather-wrapped, heated steering wheel with audio and phone controls. A passenger car such as this can only come with the best safety features. Some of the standard safety features include: Dual front advanced airbags, dual front seat-mounted side airbags, full-length side curtain airbags, roll over sensor, front seat-belt pretensioners, 4-wheel disc brakes w/ Antilock Braking System (ABS), Pedestrian Warning System, Electronic Stability Control (ESC), Vehicle Stability Management (VSM), Brake Assist System (BAS), Hill start Assist Control (HAC), Tire-Pressure Monitoring System (TPMS), side-impact door beams, front and rear crumple zones, Lower Anchors and Tethers for CHildren (LATCH), and rear child-safety door locks. Be sure to stop into Carriage Kia to get more information about the all-electric, brand-new 2015 Kia Soul EV today! With our large inventory, our team here at Carriage Kia loves helping our customers find the perfect new car or used car for them! Please feel free to contact us if you have any questions or would like to schedule a test drive!